Fixing America's ailing education system could boost GDP by $1.7 trillion a year by 2030, according to McKinsey's "Game Changers: Five Opportunities Five Opportunities For US Growth And Renewal." Of course, that's just a positive way of saying that the current talent gap is costing us big time. One source of America’s historic economic prosperity has been the high skill and education of its workforce. But this edge is now eroding as other nations surpass the United States. 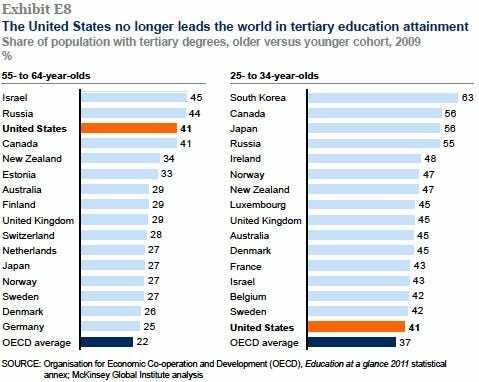 US student achievement measures have fallen near the bottom half in international rankings, and the nation’s rate of tertiary education attainment for younger workers lags dramatically behind that of other countries (Exhibit E8). Moreover, even those who receive post-secondary education may not be acquiring the skills they need: a recent McKinsey survey found that more than 60 percent of US employers are skeptical of recent graduates’ potential to succeed in their company. 1. Create non-degree training programs to give workers the specific skills needed by employers. 2. Improve learning and labor market outcomes for some graduates of two- and four-year colleges. 3. Expand the number of graduates in science, technology, engineering, and math (STEM). 4. Incorporate a greater focus on skills in targeted areas of immigration policy. Non-degree training programs. Raising the number of high school graduates receiving post-secondary, non-degree training directly translates to GDP gains. Participants often achieve better labor market outcomes than graduates of associate degree programs.170 We assume that instead of facing the job prospects typical of high school graduates, this population will exhibit the labor force participation, employment, and wage characteristics of associate degree holders.171 In addition to making this path more widely available to new high school graduates, training can benefit currently unemployed workers who lack college degrees. The historical rate of unemployment among this group is 6 percent, but today there are 1.3 million more unemployed in this group than would be expected—and they are prime candidates for these types of programs. Altogether, expanding industry-specific training programs could add $7 billion to nearly $15 billion to annual GDP by 2020. Improving learning and employment outcomes for college graduates. If current trends persist, we estimate that by 2020, roughly one-quarter of workers with bachelor’s degrees will earn less than the median full-time annual earnings of associate degree holders. Similarly, one-third of workers with associate degrees will earn less than the median wages of high school graduates. Adjusting for factors such as cost-of-living differences and voluntary choices of lower-paying careers, we find that improving labor market outcomes of these bachelor’s degree holders to match the median wage of associate degree holders and lifting these associate degree holders to the median high school graduate wage would raise annual GDP by $45 billion by 2020. Improving bachelor’s and associate degree outcomes even further—to match the median wages associated with their actual educational attainment—would add $95 billion to annual GDP by 2020. Increasing the number of STEM graduates. By reducing attrition rates in STEM fields to levels comparable with other majors, the United States can improve the persistence rate of STEM majors from 53 percent to 76 percent. In combination with increasing the enrollment rate in STEM programs from 14 percent to 24 percent, the share of US four-year-college graduates with STEM degrees can grow from 15 percent today to 23 percent by 2020, bringing the United States in line with peer countries. Increasing the number of STEM graduates can raise annual GDP by $25 billion in 2020 because of the lower unemployment rate and higher wage premium for STEM graduates over non-STEM graduates. High-skill immigration. Increasing the skill level of the net additional 7.4 million immigrants that are likely to arrive between 2012 and 2020 will also have tremendous impact on GDP. Increasing H-1B visa issuance to match the 2001 peak—that is, issuing an additional 37,000 H-1B visas each year—would increase the 2020 population of H-1B visa holders by nearly 130,000 above the baseline 2020 projection. Assuming these additional H-1B workers earn the average wage for workers with tertiary-level STEM education, this shift would add $8.5 billion to annual GDP by 2020.173 Even more significantly, the educational profile of incoming family-sponsored permanent resident workers can be shifted to give preference to those with specialized skills or tertiary degrees. (This would apply only to extended family members who would be in the labor force, not to the immediate families of citizens and permanent residents.) Applying this change only to this specific group would generate an annual GDP impact of $22 billion by 2020.